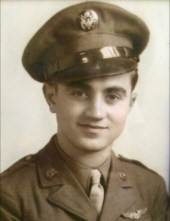 Philip Thomas Cascio Sr, 99, passed away on November 2nd, 2018 at his home in Greenville, MS.
Mr Cascio was a World War II veteran and POW. He served in the 8th Air Force 303 rd bomb group-358th squadron. He was the ball turret on a B-17 named "Spook." After a bombing mission they were shot down on February 16, 1943 and crashed into the English Channel about 20 miles off the coast of France. When the "Spook" was shot down Cascio was 1 of 3 crew members to survive. After drifting to shore, Cascio was captured by the Germans and remained a POW for over 2 1/2 years. He received The Purple Heart Medal, The Bronze Star, The POW Medal and Distinguished Flying Cross Medal. Mr. Cascio was a lifelong Delta businessman first working with his family business, New Deal Tobacco and then venturing out on his own with Delta Distributors and Cascio Storage and Warehouse. Mr. Cascio was preceded in death by his wife of 57 years, Cherry Ferretti Cascio. He is survived by his 4 children Phyllis Cascio of Townsend, TN; Phil Cascio Jr. of Paradise Valley, AZ; Jackie Cascio Pearson of Madison, MS; and Patrick Cascio of Newport Beach, California; 8 grandchildren Charlotte Creekmore, Riane Pearson, Daniel Pearson, Taylor Pearson, Douglas (Emily) Pearson, Angelina Cascio, Marco Cascio, Enzo Cascio and 3 great-grandchildren. The Family will receive friends one hour prior to services at St. Joseph Catholic Church Monday November 5, 2018 from 9 A.M. to 10 A.M. in Greenville, MS. Services will follow at 10:00 A.M. The Family wishes to thank his loving & devoted caregiver over the last 4 years and special thanks to his angel "Lutha Bell" for all of her devotion to Pawpaw. To plant a tree in memory of Philip Cascio, please visit our Tribute Store. "Email Address" would like to share the life celebration of Philip Cascio. Click on the "link" to go to share a favorite memory or leave a condolence message for the family.